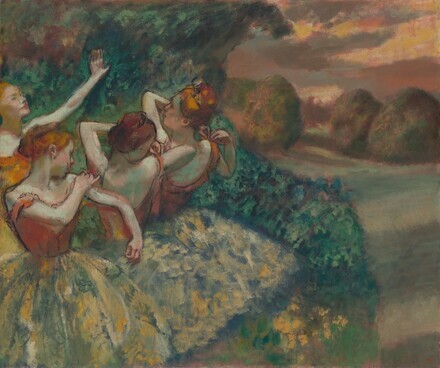 Degas studied his preferred subject, ballet performers, in hundreds of works. Four Dancers, one of the largest and most ambitious of his late works, exists in several variants that show different kinds and degrees of modification. While Degas suppressed descriptive detail elsewhere in the painting, emphatic dark lines shape the heads and arms, underlining the artist's formal concerns. Theatrical lighting over the off–stage performers recolors the figures and creates a simple color scheme of complementary red–orange and green hues. Two of the figures repeat poses of a model who appears in a unique set of three photographic negatives. Shot between about 1895 and 1898, the original plates solarized into colors that resemble, in reverse, the oranges and greens in Four Dancers. Degas owned the photographic plates and may even have taken the pictures. The same model, hair piled on her head and features indistinct or hidden, posed for all three photographs, and the four dancers in the painting resemble her. Eadward Muybridge’s sequential photographs may also have influenced the arrangement of the four dancers, particularly his 1887 book, Animal Locomotion. Their poses, a succession of preparatory gestures, depict a progression of intricate movements. Hilaire-Germain-Edgar Degas [1830-1917], Paris, France; (Degas sale, Galerie Georges Petit, Paris, 6 May 1918, no. 10); purchased by (Trotti et Cie., Paris). Wilhelm Hansen, Copenhagen. (Galerie Barbazanges, Paris). (Durand-Ruel, Paris); sold November 1931 to Chester Dale [1882-1962], New York; bequest 1963 to NGA. Provenance according to Chester Dale papers and letter dated 18 May 1932 from Durand-Ruel, in NGA curatorial records. Sale to Chester Dale noted on the front page of Art News, 21 November 1931. Degas: The Dancers, National Gallery of Art, Washington, 1984-1985, no. 49, repro. Lafond, Paul. Degas. Paris, 1918:77, repro. French Paintings from the Chester Dale Collection. National Gallery of Art, Washington, 1942: 39, repro. French Paintings from the Chester Dale Collection. National Gallery of Art, Washington, 1944: 39, repro. Jewell, Edward Alden. French Impressionists and their Contemporaries Represented in American Collections. New York, 1944: repro. 184. Lemoisne, Paul André. Degas et son oeuvre. 4 vols. Paris, 1946-1949: 3(1946):736, no. 1267, repro. French Paintings from the Chester Dale Collection. National Gallery of Art, Washington, 1953: 48, repro. Evans, Grose. French Painting of the 19th Century in the National Gallery of Art. Washington, D.C., 1959 (Booklet Number Two in Ten Schools of Painting in the National Gallery of Art, Washington, D.C.): 32, color repro. Walker, John. National Gallery of Art, Washington, D.C. New York, 1963 (reprinted 1964 in French, German, and Spanish): 264, repro. Eighteenth and Nineteenth Century Paintings & Sculpture of the French School in the Chester Dale Collection, National Gallery of Art, Washington, 1965: 78, repro. Minervino, Fiorella. L'opera completa di Degas. Milan, 1970: no. 1112, repro. Reft, T. "Degas: A Master Among Artists." Metropolitan Museum of Art Bulletin (Spring 1977): unpaginated, repro. Watson, Ross. The National Gallery of Art, Washington. New York, 1979: 116, pl. 102. Kelder, Diane. The Great Book of French Impressionism. New York, 1980: 284, 306, 435, repro. Walker, John. National Gallery of Art, Washington. Rev. ed. New York, 1984: 476, no. 702, color repro. Kopper, Philip. America's National Gallery of Art: A Gift to the Nation. New York, 1991: 239-240, 242, color repro. National Gallery of Art, Washington. National Gallery of Art, Washington, 1992: 205, repro. Stuckey, Charles F. Claude Monet 1840-1926. Exh. cat., Art Institute of Chicago, 1995:221, repro. Kendall, Richard. Beyond Impressionism. Yale University Press, 1996:28, 38, 112, 119, repro. Kelder, Diane. The Great Book of French Impressionism, 1997, no. 271, repro. Vogel, Carol. "Finding Fashion and History on th Edges: Museums Look Again at Their Picture Frames." New York Times (September 2, 1999): C1, C3. Hand, John Oliver. National Gallery of Art: Master Paintings from the Collection. Washington and New York, 2004: book jacket back, 377, no. 311, color repros.